- For the first time in the history of the PGA Tour, Korean players on the same team finished as co-runners-up. A truly historic moment. - CJ Logistics sponsors eight golfers. The company and players are creating shared growth synergies. CJ Logistics (CEO Park Geun-tae) announced that Byeong-hun An, Meen-whee Kim, golfers the company currently sponsors, shot a 20-under-par 268 on July 30 at the RBC Canada Open, a PGA Tour held at Glen Abbey Golf Club (par 72, 7,253 yards) in Oakville, Ontario, Canada, and finished 2nd. eventually went to Dustin Johnson, No. 1 in world rankings, who recorded a 23-under-par 265. In PGA Tour championships, this is the first time that Korean golfers on the same team finished 2nd, marking a new era in the history of Korean golf. CJ Logistics is delighted because the successive strong performance of its golfers this year is spreading its image as a company taking a bold leap forward toward becoming a global logistics company. PGA Tour championships are global sporting events that are watched by over 1 billion golf fanatics in 226 countries around the world in 23 languages. Four CJ Logistics golfers (Byeong-hun An, Meen-whee Kim, Si-woo Kim and Sung-hoon Kang) competed in the RBC Canada Open. 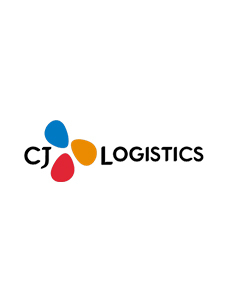 As they are wearing hats with the CJ Group logo and shirts with the English logo of CJ Logistics, they are expected to greatly enhance the public awareness of the company and the image as a global enterprise among viewers of the world, and thus create an impressive promotional effect. Also, the players are elevating the brand awareness of CJ Logistics to a level higher in the global logistics market, and their solid performance lead to business talks with and proposals to global shippers regarding logistics service and winning contracts for projects. Accordingly, as CJ Logistics is actively seeking to advance into overseas markets through M&A of late, the players’ remarkable performances are expected to create more global business opportunities and further enhance its competitiveness. 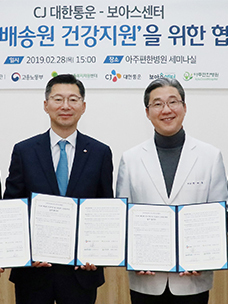 CJ Logistics has been helping Korean golfers develop and enhancing its status since 2015 by sponsoring them on the global stage, and it is currently sponsoring a total of eight golfers, Si-woo Kim, Byeong-hun An, Meen-whee Kim, Seong-hoon Kang, Gyeong-hun Lee, Dong-hwan Lee, Seong-jae Im and Min-kyu Kim. In particular, the performance of the golfers, sponsored by CJ Logistics, is truly remarkable this year. Meen-whee Kim proved to be the winner in the KPGA Descente Korea Munsingwear match play last June, and finished second in the PGA, and Byeong-hun An was a runner-up in the PGA Tour twice this year, and Seong-jae Im won the Web.com Tour Championship once, and finished second twice, while Min-kyu Kim became the youngest golfer to win the European Challenge Tour. CJ Logistics is providing title sponsorship for Superrace, the largest racing sports event in Korea, to convey the image of the company to the entire world. The company is now taking a bold leap forward toward becoming a global logistics company through the dynamism of racing cars, the culmination of state-of-the-art technologies, and global motorsports, as well as golf. 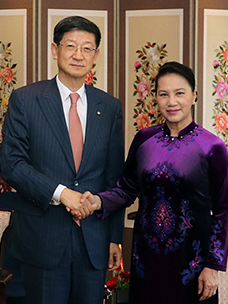 CJ Logistics will further expand its global business, and diversify its growth strategy, such as M&A, strategic alliances, joint ventures and acquisition of shares, and it is planning to accelerate its leap forward toward becoming one of the global top 5 logistics companies by further expanding its network and size through continuous growth.